Our company does quality freezer repair in Oakland as well as freezer repair in Novato. We can fix chest freezers, upright freezers or dual zone freezers. No matter what brand or model your freezer is, we can fix it in no time. In particular, we repair Avanti, Frigidaire, GE, Haier, Kenmore, Maytag, Whirlpool and much more. Our team of technicians is factory trained and certified to repair all the major brands. Just one call to us and your freezer will be working as good as new. If you are thinking about buying a new freezer, please give us a call first. We will get all the info from you over the phone and tell you if your freezer is worth saving. It is very likely that it is. Then we will give you an accurate estimate and will be ready to go over to your house to repair your freezer. By fixing your freezer instead of buying a new one, you can save a lot of money. An appointment with us is easy and fast. Most impotently you end up with perfectly functional freezer in the end. Top Home Appliance Repair is most respected home appliance repair company in your area. We have huge experience fixing anything from refrigerators and freezers to ovens and barbecue grills. We are family owned, and family operated a business. We are the closest freezer repair specialists near you. Our service area includes East Bay, Marin County, Oakland, and Novato as well as surrounding areas. We do both residential appliance repair as well as commercial appliance repair. That includes commercial kitchen repair for any restaurant, cafeteria, careering business and much more. We provide a variety of major home appliances repair services. Those services include refrigerator repair, washer repair, dryer repair, dishwasher repair, stove and range repair, oven repair, steam oven repair, microwave repair, ice maker repair, barbecue repair, pizza oven repair, patio heater repair and much more. We have gathered the most fantastic, experienced and knowledgeable team of appliance repair specialists. Their skills are phenomenal, and they will figure out any problem you might have with your freezer. But also, they are all pleasant and polite people. So, an appointment with us will be a comfortable and stress-free experience. Excellent customer service is very important to us. We repair all home appliances such as Asko, Bertazonni, Bosch, Dacor, DCS, Electrolux, Fisher&Paykel, Frigidaire, GE, Jenn-Air, KitchenAid, La Cornue, LG, Liebherr, Marvel, Miele, Perlick, Samsung, Siemens, Sub-Zero, Thermador, Traulsen, True, Viking, Whirlpool, Wolf and many other brands. After our licensed technicians find the problem, they will set out to fix it as soon as possible. Often parts are needed. Thankfully we bring a majority of freezer parts along with us. So, we don’t have to waste time ordering them. But if we do need to order, we will do it promptly. The parts we carry are all very high quality and well priced. Finally, your freezer is fixed, and we do the final safety check to make sure it’s safe. 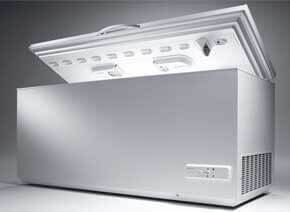 We turn it to you a perfectly clean and fully functional freezer that can last you for many years to come. Also, we will give you some helpful tips on how to keep your freezer in top shape. Call us for the best freezer repair in Oakland and freezer repair in Novato. Why pick us to do freezer repair for you? Our appliance repair services are professional, fast and reasonably priced. We have the skills and years of hand on experience that makes us a perfect candidate to do the job for you. Our technicians are all factory trained and certified. They know all the ins and outs of freezer repair. They are known to do the work fast and to do the job right the first time. We make sure our team is continually educated and certified on all the latest technology. After an appointment with us, you will get a fully functional, clean and safe appliance. Customer satisfaction is guaranteed! For all your freezer repair in Oakland as wells as freezer repair in East Bay call us at 925-265-7782. For your freezer repair in Novato and freezer repair in Marin County, please call us 628-214-0064. Or you can fill out our short contact form. We would love to talk to you and answer all of your questions. Our service area includes Alameda County, Alameda, Berkley, Dublin, Hayward, Livermore, Oakland, Piedmont, Pleasanton, San Leandro, Contra Costa County, Antioch, Brentwood, Clayton, Contra Costa, Concord, Danville, Discovery Bay, East Bay, Lafayette, Oakley, Orinda, Pittsburg, San Ramon, Walnut Creek, Santa Clara County, Sunnyvale. This Michael came over to fix my broken freezer. It was a nice Sub-Zero so replacing it would of cost me a lot. Michael came in and inspected it. It was a tripped circuit breaker that was pretty easy to fix. He was also nice enough to show me some tips on how to keep my freezer from over freezing. So, basically my freezer is up and running and I know who I am going to call next time something in the kitchen breaks.